Cornwall Council has provided free parking for Saturday 1st December at both the Foundry and the Commercial Road Car Parks. 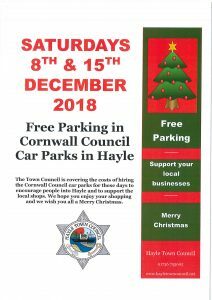 The Town Council is covering the costs of hiring the Cornwall Council car parks for Saturdays 8th and 15th December to encourage people into Hayle and to support the local shops. We hope you enjoy your shopping and we wish you all a Merry Christmas.